Seventy years ago the greatest massacre in history began – with the financing from the Bank of England and the Federal Reserve System of the United States. A recent resolution by the parliamentary assembly of the OSCE declared that the Soviet Union and Nazi Germany held equal roles in unleashing WWII. Furthermore, the resolution has the purely pragmatic goal of pumping Russian money into a few bankrupt economies while seeking to demonize Russia as the successor to the Soviet Union and prepare the legal groundwork for depriving Moscow from opposing this revisionist view the war. But if we are to debate the culpability for the war’s outbreak, then we need to begin by answering this key question: who accommodated the Nazis’ rise to power, who directed them towards global catastrophe? Germany’s entire prewar history shows that the “necessary” policies were all provided for by guided financial turmoil – the same situation, by the way, that the world finds itself in today. 1st: 1919-1924 – Preparing the grounds for massive American financial investments in the German economy. 2nd: 1924-1929 – Establishing control over the financial system and funding the National-Socialist movement. 3rd: 1929-1933 – Inciting and unleashing a deep economic crisis ensuring the Nazis would rise to power. 4th: 1933-1939 – Financial cooperation with the Nazi government and support for its expansionist foreign policy, aimed at preparing and unleashing the new world war. In the first stage, the major leverage for the penetration of American capital into Europe came from war debts and the closely related issue of German reparations. After the United States’ formal entry into WWI, the U.S. provided its allies (primarily England and France) with loans amounting to $8.8 billon. The total sum of war debt owed to the U.S., including loans offered between 1919 and 1921, amounted to $11 billion. To solve their own financial problems the debtor countries went after Germany, forcing it to pay an enormous sum in reparations under extremely difficult conditions. The resulting flight of German capital abroad and refusal by companies to pay their taxes resulted in such a state deficit that all the government could do is mass produce German marks without backing. The German currency collapsed as a result. During the hyperinflation of 1923, the inflation rate reached 578,512% and one dollar was worth 4.2 trillion Deutsch marks. German industrialists began to openly sabotage all attempt to pay the reparations, which eventually sparked the famous “Ruhr crisis” — a Franco-Belgian occupation of the Ruhr valley in 1923. A new project was developed in the bowels of J.P. Morgan and Co. at the behest Montague Norman, head of the Bank of England. At the heart of the project were Dresdner Bank representative Hjalmar Schacht’s proposals, which had been formulated in March 1922 at the request of John Foster Dulles, future Secretary of State under Eisenhower, and legal advisor to President Woodrow Wilson at the Paris Peace Conference. Comment: Brothers in Armchairs [link], John Foster Dulles and Allen Dulles (CIA director 1953 – 1961). Dulles passed the proposals to the chief trustee of J.P. Morgan and Co., who then gave recommendations to Schacht, Norman and – at last – to Weimar officials. In December 1923, Schacht became the director of Reichbank and played an instrumental role in bringing together the Anglo-American and German financial circles. In the summer of 1924, the project, known as the “Dawes Plan” (named after an Charles G. Dawes, the American director of one of Morgan’s banks, who chaired the committee of experts who preparing the proposals) was adopted at the London Conference. He called for halving the reparations to be paid, and also settled how Germany would pay them off. However, the primary goal was to provide favorable conditions for U.S. investment, which could only be made possible by stabilizing the German mark. Firstly, due to the fact that the annual reparations payments were to cover the allies’ total debts, the so-called “absurd Weimar cycle” developed. The gold that Germany was using to pay war reparations was heaped up and sold to the U.S., where it disappeared. From the U.S., according to the plan, gold was going to Germany in the form of “aid”, which was then paid back to England and France, who then sent it back to the United States to pay off their war debts. The U.S. then placed a heavy interest rate on it and sent it back to Germany. In the end, Germany lived off of debt, and it was clear that should Wall Street withdraw its loans, then the country would suffer a complete meltdown. Secondly, although the loans were officially given to Germany to ensure the payment of reparations, in reality, they were designed to restore the country’s military-industrial potential. In fact, the Germans paid off the loans with shares of German companies, allowing American capital to actively integrate itself into the German economy. The total amount of foreign investment in German industry from 1924-1929 amounted to nearly 63 billion gold marks (the loans accounted for 30 billion of this), and 10 billion in reparations was paid off. American bankers – primarily J.P. Morgan, provided Seventy percent of Germany’s financial income. As a result, as early as 1929, Germany’s industry was second in the world, but to a large extent it was in the hands of America’s leading financial-industrial groups. Thus, I.G. Farben, the company that became the German war machine’s key component, was under the control of Rockefeller’s Standard Oil at the time it funded 45 percent of Hitler’s election campaign in 1930. Through General Electric, J.P. Morgan controlled the German radio and electrical industry in the form of AEG and Siemens (by 1933, General Electric owned a 30 percent stake in AEG). Through telecom company ITT, he controlled 40 percent of Germany’s telephone network and 30 percent of aircraft manufacturer Focke-Wulf. Opel was taken over by the Dupont family’s General Motors. Henry Ford held a 100 percent stake in Volkswagen. In 1926, with the participation of Rockefeller bank, Dillon Reed and Co., the second largest industrial monopoly emerged – metallurgical firm Vereinigte Stahlwerke (Unified Steel Trusts) of Thyssen, Flick, Wolf, Fegler, etc. American cooperation with Germany’s military-industrial complex became so intense and pervasive that, by 1933, American capital had reached key sectors of German industry and even major banks like Deutsche Bank, Dresdner Bank, Donat Bank, etc. Simultaneously, a political force was being financed that would be called upon to play a crucial role in the Anglo-American plans – the Nazi party and Adolf Hitler himself. 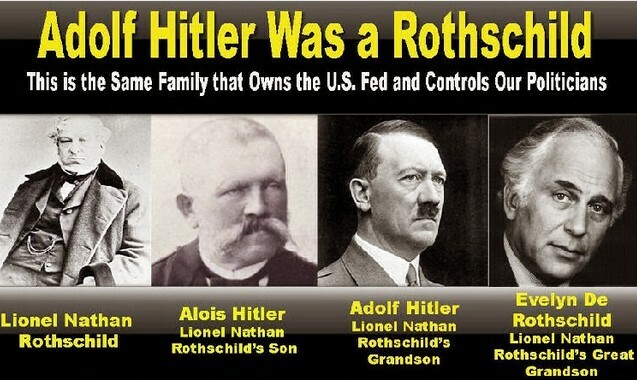 German Chancellor Brüning wrote in his memoirs that beginning in 1923, Hitler received large sums of money from abroad – from where exactly is unknown, but it passed through Swiss and Swedish banks. 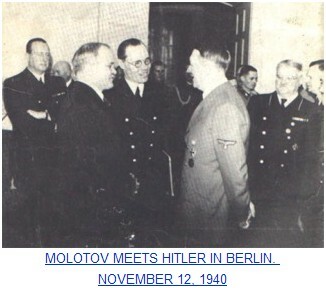 It is also known that in 1922, Hitler met with U.S. Military Attaché Capt. Truman Smith in Munich – a meeting Smith recounted in a detailed report to his Washington superiors (in the Office of Military Intelligence), saying he thought highly of Hitler. It was through Smith’s circle of acquaintances that Hitler came into contact with “Putzi” (Ernst Franz Sedgwick Hanfstaengl), a Harvard University graduate who played an important role shaping Hitler into a successful politician, giving him substantial financial support and connections among senior British figures. Hanfstaengl was the son of a successful art dealer and had dual U.S. – German citizenship. He was born in Bavaria, and graduated from Harvard University in 1909. The half-German tranquilly spent the whole of WWI in America. Not only was he, as a German citizen, not arrested – even after the United States declared war on Germany – but after promising “not to engage in any anti-American activities,” he was left alone. Why? Because his lawyer, was U.S. Secretary of State Theodore Roosevelt! … Ernst earned the nickname “Putzi” among the Nazis, meaning “kid” (and “funny” and “amusing”). Under this name he entered German history books in the Nazi movement. Historians remember nothing, and paint Hanfstaengl as a joker, forgetting that such a role is the most convenient for the hidden influence of a puppet master. … Putzi’s true value in forming the Nazi’s into a party and Hitler into a leader is still not fully appreciated. … Putzi Hanfstaengl was rich and could afford to help out a novice politician – to direct, and put on the right path. … in 1923, Hanfstaengl holds a series of geopolitical discussions with Hitler, enlightening the future fuehrer and expanding his horizons. And already in 1924, “the student” writes his own book, word for word repeating the thesis of his friend. So who is the real author of Mein Kampf? It turns out it was an American spy. … In the summer of 1932, an extremely influential British politician came on a personal visit – Winston Churchill. … [Hitler] didn’t even go to the meeting with Churchill, in spite of Ernst Hanfstaengl’s many persuasions! … in February 1934, [Hanfstaengl] left without the Fuhrer’s consent to meet with … Benito Mussolini. The modest press secretary’s mission was to nudge El Duce to normalize relations. [Hanfstaengl] left Germany in March 1937. More precisely, snuck out, supposedly after getting into conflict with some in Hitler’s inner circle and felt his life was threatened. … During the Second World War, Hanfstaengl would work … as an advisor to President Roosevelt! But, the Nazi Party experienced a miraculous boom: in September 1930, thanks to large donations from Thyssen, I.G. Farben, and Kirdorf, the party collected 6.4 million votes – putting it in second place in the Reichstag. Shortly thereafter appeared a generous infusion of funds from abroad. Hjalmar Schacht became the key link between the major German industrialists and the foreign financiers. On January 4, 1932, at a meeting between Adolf Hitler, German Chancellor Franz von Papen and Montague Norman, a secret agreement was reached securing funding for the Nazi Party. The American politician, Dulles, was also present at this meeting – something his biographers don’t like to mention. 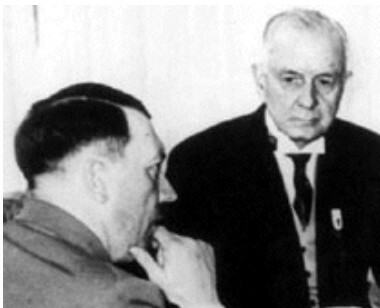 On January 14, 1933, Hitler held a meeting with Kurt von Schroeder, a Nazi-sympathizing banker, von Papen and Kepler, where the Hitler’s program was fully approved. It was here that the final path for the Nazis’ rise to power was laid, and on January 30, Hitler became chancellor. In the summer of 1934, Britain signed the Anglo-German Transfer Agreement, which became one of the foundations of British policy towards the Third Reich, and by the end of the 1930’s, Germany developed into Britain’s primary trading partner. Schroeder’s bank turned into Germany’s and Great Britain’s main agent, and in 1936, its New York branch merged with a Rockefeller holding to create the investment bank “Schroeder, Rockefeller and Co.”, which the New York Times described as “economic-propagandist axis of Berlin-Rome”. As he admitted himself, Hitler viewed foreign credit as the financial basis of his four-year plan, so this didn’t raise the slightest alarm. 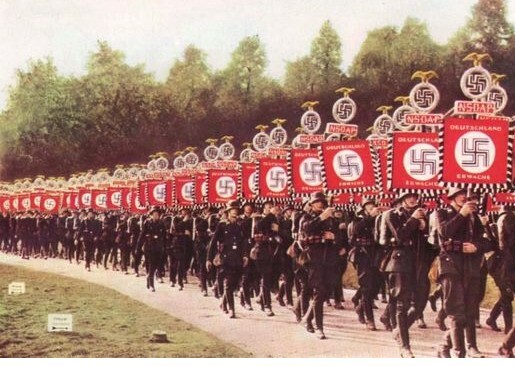 In August 1934, American oil giant Standard Oil purchased 730,000 acres of land in Germany and built large oil refineries that supplied the Nazis with oil. At the same time, the United States secretly provided Germany with the most modern equipment for airplane factories, which would soon produce German aircraft. Germany received a large number of patents from American firms Pratt and Whitney, Douglas, and the Bendix Corporation, and the “Junker-87” dive-bomber was built using purely American technology. By 1941, when the second world war was in full-swing, American investment in the German economy totaled $475 million, Standard Oil invested $120 million alone, General Motors — $35 million, ITT — $30 million, and Ford — $17.5 million. 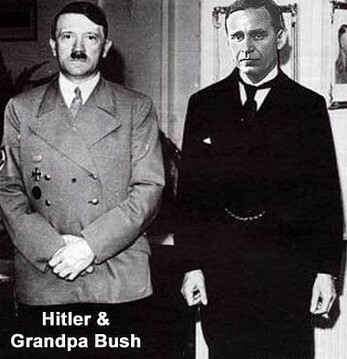 The intimate financial and economic collusion between Anglo-American and Nazi businessman was the backdrop against which the policy of appeasement to the aggressor took place – leading directly to World War II. Today, while the global financial elite has embarked on a plan of “Great Depression part II” with the subsequent transition to a “new world order”, it is imperative to identify its key role in organizing crimes against humanity in the past. ORIENTAL REVIEW has completed exclusive translations of the chapters from Nikolay Starikov’s documentary research “”Who Made Hitler Attack Stalin” (St.Petersburg, 2008). Mr. Starikov is Russian historian and civil activist. The original text was adapted and translated by ORIENTAL REVIEW. This entry was posted on September 26, 2015 by HKW in Bankers, NWO and tagged Funding Hitler, Nazism, World War 2.